Vighnam Nihantu Nah Sarvam Raktavarno Vinayakah!! Vijaya Ganapati is depicted as having four hands – the hands hold rope, hook, broken tusk and a mango. The body color of this form is blood red. 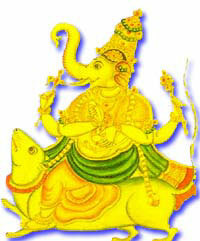 Another speciality of this form is that it is shown riding the mouse – the vehicle or vahana of Ganesh. Vijaya means victory or success. This form Ganapati grants its devotees success in all ventures.